U.F.O abductee stories as related by the people who experience them , I leave it to you to form your own opinion's. U.F.O abductee stories as related by the people who experience them from their cars, homes and places, I leave it to you to form your own opinion's. This is Steve Hutchins From Powhatan Virginia. 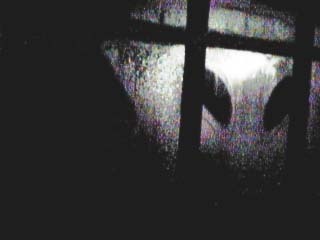 Last night I got up to check my email and I look through my bed room window and saw this face at 3:00am in the morning looking in.I ran to get my camera and took the picture then it left. WOW hope this waking up early in the morning and looking through my window and seeing this sort of thing don,t happened again. Thanks and hope some one can tell me what I saw. had got it from watching 'Close Encounters' and seeing Star Trek. Would anyone care to tell me anything about my dream? What is, in your opinion, the likelihood that visitors abducted me? Or was I just scared by the fireworks? lofty bag-of tricks!. It was near 1 a.m. on the morning of April 15, 1975. After a meeting in Los Angles, I was driving home alone of the Santa Ana Freeway, heading Southeast in a small, dark blue, 1959 Mercedes coupé. The sky was clear and the weather moderate. A few miles past the L.A. interchange, I'd just lit a small cigar a friend had given me when a very clear voice popped into my head, saying: "Is that a weapon?. Before I go on, I should emphasise that after years of working with psychics, not to mention my own ESP experience since childhood, my reaction to things inward had become more than a little casual. So I replied in a perfunctory way, 'No, this isn't a weapon' and then went on to describe the act of smoking, ending with: 'Who wants to know?. Immediately I looked to the Southwest sky on my right, out the front windshield. There, at about a 50-degree angle and moving with me at what seemed to be the same speed, was a ruby-red light travelling in an up/down, wave-like motion. (Mentally I can 'see' that light in my mind as vividly as when I saw it that day.) I 'knew' it was a UFO - not an aeroplane or helicopter with a running red light, even though I was unable to distinguish an outline that would indicate a solid object." times as I repeated the manoeuvre to see if it would follow my lead. Although I was calm at this point, I felt a growing anticipation which prompted me to urge the light to stay with me since I planned to exit the free way a few miles ahead. Falls N.Y. Gail is divorced. Three beings were dressed in something that looked like tightly fitting jump-suits and stood in a single row, one behind the other. The light in the hall was dim, and she could not see their features. She noticed they were about five feet tall with very long arms. The leader, according to Gail seemed to have a problem getting into the room. It was as if some type of invisible shield was blocking his way. He lifted up his hand and pressed them against the invisible shield. The leader then took some type of rod out from a side pocket and turned the bottom of it. The rod then glowed with a green light and he passed it over the doorway area. They then walked into the room without any effort. As they entered the room still in a single file she noticed that they had large heads and eyes that looked like a cats which wrapped around their heads. She never heard them talk but heard all kinds on buzzing noises in her head when the leader communicated with the others. they came, they did exactly the same thing. Including having trouble getting into the doorway to the bedroom. My daughter was once again away visiting her father." This case is still under study, but initial findings indicate that both Gail and her daughter may have a history of interactions with the intelligence behind the UFO phenomenon. GO BACK TO THE TOP CASE No.4 TITLE: UFO ABDUCTIONS: BEYOND MATTER? mantra within herself. Breaking out of the alleged abduction by shear force of will is just one clue of its non-physical nature. Are there others? Looking at the varied testimony of abductee's, one gets the sense of the lack of coincidence from report to report. One person stated that she was transported through her apartment wall. While others feel the abductors take them "by hand" into waiting UFO's. Whitley Strieber, in his book "Transformation", writes about his attempts at astral travel and the similarity of that experience to his abductions. He also notes the strangeness factor of abduction reports from his article in UFO Magazine (Vol 4, Num 2). Strieber writes, "Of the 690 narratives sent to me by Communion and Transformation readers, only a few appear to support these present theories of abduction. The vast majority instead describe perceptions and experiences far stranger than any reported by mainstream abduction researchers." Another UFO researcher, Richard Grossinger, writes of the inability of contactees to distinguish between the concrete or real and the psychic or hallucinatory. He suggests that we may be dealing with both levels of reality thereby creating the current paradox of conflicting abduction testimonies. more psychological in nature than physical. Yet the common belief is in physical contact! Is this what we are meant to believe? GO BACK TO TOP OF PAGE CASE No.5 Suggest you download this page for offline viewing. with the gun to her shoulder. This was in Arkansas on a 500 acre cotton plantation. They floated me across the living room and the door was closed, it never opened. We went through wall and all. I remember going up the ramp but didn't remember entering. My next memory was sitting on a table affair in a circular room. Very cold and very frightened. I was put through a physical examination. They took me back and tucked me in; my mother was still at the window. They were 3.5 to 4 ft tall. Very soft grey colour which looked almost white. Large black round eyes. Very large head. No ears. Two little holes for a nose. A slit for a mouth. Their skin was marsh mellowly. Please describe the black helicopter experience and also phone tapping and being followed that we heard about and have you done an FOIA for info on a file about you with FBI NSA, etc? looked out the window near Perry, MI, the black Helicopter was pacing our car. lot. The blinking light of the copter is on video. this is a stunt to gain support for your appointment. had nothing to do with the helicopters appearing at any time. How much did your mother remember of the abduction shooting, or anything? <1> Any markings on the helicopter that stand out in your mind. on the lookout for these copters (or am I talking out of school)? around much. Regarding the question of the list, we are aware of that. Ted, did the being speak or communicate anything vocal or were there any sounds at all. Shirley, Yes they communicated telepathically. Ted, Did they say anything verbally or was it all telepathic? Shirley, It was all telepathic. DON, I just signed in, and wanted to ask about your suspicions concerning tapped telephones, etc. Have you been able to have your lines swept by the phone co. or perhaps private security firms? Also have you had any problems with mail, or any other reason to suspect you are under surveillance? If you think that it may be from fed. government, the FOIA will enable you to find out if there are any files on you, and what they contain. they have us under surveillance. because we work with abductee's. understand what happened, because I didn't abort. experienced this type of encounter? wispy. He has very blue eyes. A blue you cannot really describe. activities. Strictly nuts and bolts. Shirley, Regarding the Lincoln conference, does a cat a have a tail? without thinking Budd showed me some drawings. And I burst into tears. to all of us. Wise of you not to look at Budd's book yet. Shirley, prefer not to say. abducted, but when they were aware of the pain they eased it for us. group are there? and finally. Can I call you during the day this coming week? us to the west. All the lights were on all the time, but each light would individually pulse bright. The pulse would take about one second to complete one revolution. That night was a clear one, with no wind and few stars visible in the glare of the city lights. There are high tension power lines in the area. No sound was heard. The objects were about 20 degrees above the horizon. In our interview with Deborah, she said she was "scared. I felt like they were looking at me and I felt like I knew who they were and they were coming back. Investigators Harry Tokarz and Joe Muskat did what the two police officers had done on the night of the event -- they carefully looked at the area where the UFOs were seen -- a small park and a children's playground. No traces were found, nor was there any damage to the trees. records, there was no mention of any such prior check by a Staff Sargeant. Deborah said she was afraid to undergo hypnosis. She said that an amateur hypnotist had unsuccessfully tried to hypnotize her years ago. She used that and her fear of what she might find out as her reason for declining to pursue regressive hypnosis. Hypnosis would give some scientific credibility to CUFORN's investigation and could relieve her fear or the trauma she may have undergone as a result of an abduction by humanoids. Unless she changes her mind, we will never know for sure what happened to her over the years. Lawrence Sherman, Jr., who is an architect former U.S. Air Force officer who was based in the Pacific. Sherman's late father was Chairman of the Joint Intelligence Staff at the Pentagon and a friend of the late U.S. Air Force General NATHAN TWINING of MJ12. Colonel Lawrence Sherman, Sr. was also the Director of U.S.A.F. What got my attention was when we went camping this summer as we do every year. I noticed these freckles that are in perfect alignment on my son face. Two triangles one small and then in the same spot a larger one. Well we were joking around an said oh maybe it is from the aliens. Well ha got all upset and started to cry. He cries easily to begin with but he had a fear look in his eyes. That is when I started to look up things that happened to people. A few years back I think in 1995. Well I had put my son to bed at his regular bedtime 8:00. I saw a flash an I thought it was maybe just lightening. Never really paid attention to it. Later that night around 3:00 in the morning I heard my son scream really loud. I jumped from the bed to see what was the matter. I went to his room but he was not there. I went to the couch and he was sitting up with a horrified look on his face. All he said was the aliens hurt me. I walked him to his bed. Told him he had a bad dream. He finally went to sleep after quite awhile. Location, Waimata Valley NZ - I lived there on our family farm. Event Circumstances, It Happened during a UFO flap that centred on Waimata Valley and Gisborne at the same time UFO's were filmed from a plane over the South Island of NZ. Main Event, I was a guest on a scout UFO and was taken into space for urgent medical attention on a larger space ship when the operation in my nose went wrong. We'd had UFO sightings reported for over 2 months along Waimata Valley Road near our house So I decided to sleep with a torch and the next time one flew over our house I'd get out my window with the torch and start signalling it. One flew over our house and I jumped out the window and began signalling it. There were two ET's in a window looking down at me. I could read their telepathic conversation to each other, one was saying lets carry on, this is of no interest and the other said to wait, this could be of interest. At this point I was flashing the torch and waving at them like any excited kid and I thought "yes - I've won them over". the one that said this might be of interest immediately telepathically told me I had not won them over and next thing I remember I'm in a corridor on the scout ship jumping up and down going it's true! it's true! you are real and there were at least 2 Et's just standing there looking at me trying to get a handle on the sight of an over excited teenage boy in pyjamas going off in front of them. What was of interest to them was that I could read their telepathic conversations to each other. I also learned they have ways of telepathically talking one on one and ensuring on ET nearby can listen on to the one on one chat. Once I'd calmed down from hyperactive to just animated the tall one walked asked me why I had been unsure if they were real and why was I out there flashing my torch at them. I replied that we'd been told they weren't real and others were saying if they were real they were here to harm humans. I said they'd been over our house for the past few months and I was still fine so obviously they were not here to hurt us so I decided to attract the attention of the next one that flew over our house. The tall one asked who was saying they were here to harm them and I said - the Americans said this all the time but I stopped believing that when they'd been over our house for a few months and we hadn't been harmed by this. the Tall one was not happy to hear that I'd been told ET's were here to harm humans. The tall one told me they'd met humans and had not received a friendly reaction from humans. Humans had not made them feel welcome on Earth. I said well on behalf of humans they were welcome here. I think the Tall one and short ones were trying not to telepathically laugh at a human child welcoming them on behalf of humanity but I was so excited and I'd blurted it out as I really wanted them to feel welcome. They told me the Russians were just like us and that I had to like the Russians as well as the Americans as we were all one species. This freaked me out and I had a stand up argument with them saying the Russians were not our friends as they were communists and if they were our friends why were they building so many more weapons than they needed and the Tall one kept saying we ( communist or capitalist) must get along as we were all the same. I just couldn't accept this concept so we dropped the conversation and went to a room. A some point they put me in a trance to keep me in one place while they went to another room. I snapped myself out of the trance and went wandering around the corridors. A little ET spotted me and was surprised as was the Tall ET but the tall ET told the little ET I was safe so to let me look around. The little ET followed me everywhere during this phase. Then my time for medicals began so I went back to the room and got on the table/bed. There the tall one told me that they had not been offered much co-operation from Humans and it would like my assistance, by this time it was standing over a bench in the corner of the room preparing some hand held instrument and I was lying on my back on a body temperature metal or plastic table. I said I'd be happy to help it, it could take off an arm if it wanted as long as it didn't harm my ability ti think as that was important to me. It was touched by that remark and laughed that it didn't need an arm but would do other things. It did whatever it did then began to put a powered instrument up my nose. I said it looked like it would hurt me and it said if I liked it would stop any pain and I said yes please so it gave me the image of a moth crawling up my nostril while the instrument went in. While the instrument was up there doing whatever it did the ET dropped their guard and telepathically I picked this up so I seized the moment and jerked my head back violently with the instrument still active deep in my nostril. The ET was quick to stop the instrument but the damage had been done, it had sliced me up wherever it was inside my nostrils. The ET asked " why did you do that" and I said now you'll have to take me with you, you won't be able to fix that in time. There was a mini conference with the ET's in a corridor and The scout ship bolted to space. I was allowed out to watch as I felt the motion and I was over the moon as I felt this meant I was going with them to their planet. I saw the big ship as we approached it and was transferred to it to be repaired. Sometime during the repairs I realised I was to be returned to home and I was really upset by this so I tried to persuade them my parents didn't love me and I really wanted to go with them. They said I wouldn't live with them and wouldn't explain why I wouldn't then they showed me footage of my mother panicking in the house as she'd gone to my bedroom and couldn't find me. They used this to show me my story about not being loved by my parents was not true as my mother was panicking so I had to be returned to her. I accepted defeat and went back to the scout ship to be returned. I asked them if they'd visit us and would they please come for dinner and meet my family. The tall one asked if we would cook vegetarians and I said we had vegetarians but they were not normal, we all ate meat. The Tall one was not impressed with meat consumption. They said they would definitely be back. They dropped me off in daylight just in time for me to go to school. While wandering around the scout ship I'd pocketed a small item. I'd kept it with me and the little ET knew I had it. The big ET one either didn't know or pretended not to know that I had it. AS I was being let out the door of the scout ship the little one said to stop me as I had an item of theirs. I was asked to stop so I did, no force was used. There ware about 4 of them grouped around me in the corridor and the tall one came over and said " have you got anything" I said no an the tall one immediately flashed me a telepathic warning that the others couldn't hear which said "this is important - hand it over" so I conceded defeat and handed ti over and tried to justify it by saying " I had to do it you know" then I was transferred back to my bedroom. My father saw me being returned and wouldn't touch me until Mum made him. My mother was in the house. Unusual observations? Movements, sounds, lights, odours, etc Nothing unusual, it was a metallic disc that hovered quietly and had windows which I could see into when I was standing below it and I could see out of when I was in it. There were on surprises in the interior, it had corridors, separate rooms, a flight control area which was ergonomically correct for a 16 year old and which would have been relatively easy to learn as it looked conventional and uncluttered. The temperature was normal and the furniture was functional for humans as well as ET's. Any human would feel comfortable inside it. The ET's each had distinct personalities. The tall one who did the nose operation on me in the scout ship was very familiar with humans and was relaxed around me. I could chat telepathically with it and it loved talking, it was very enthusiastic about humans and their potential and was surprised humans had not been as positive in their attitudes towards ET's. There was also a short ET that was a bit shorter than me. It didn't trust me and kept following me around. It nearly freaked when I wandered into the flight deck and was leaning over the instrument panel/console. I told it when I grew up I was going to fly these (I meant planes as a pilot but it thought I meant fly UFO's - it dismissed the idea of me flying UFO's when I grew up as ridiculous). The short ET had very limited experience with Humans and felt we were barbarians - not to be trusted. It was watching me to learn more about this human species that it had been warned about but had not had not seen first hand before. That's the impression I was getting from it. I didn't help improve it's attitude as it caught me trying to steal a souvenir and it kicked up quite a stink when it looked like I was going to be released with the souvenir still in my procession. Describe your location relative to the sighting When the ship stopped above me it was say 10 - 20 metres above me and in front of me so I could easily see into it's windows and see the 2 ET's discussing me. It never landed I was in one spot one moment and in the ship in the next moment. Other people? Names, contact details Here are other events reported on the web concerning the UFO flap at the time 1. THE U.F.O. BBS - http://www.ufobbs.com/ufo Originally dated 5 Aug 1993, 17:29 In the Waimata Valley, New Zealand, Decemebr 2, 1977, a farmer was awoken by his dog barking and, upon investigation, saw a landed "flying saucer" on the ground. Two humanoids were carrying one of his dogs between them and moving towards the object. They were 143 cm tall and wore close fitting, metallic silver overalls and white, opaque helmets. These overalls were gathered at the ankles with elastic cuffs which extended over red glowing boots. On the entities' hands were large silver gauntlets with flared arm coverings extending half way up the forearms. The white helmets were rounded like large motorcycle helmets and extended from shoulder to shoulder without any markings or openings. Alarmed my this sight, the farmer fired a shot and apparently winged one of the entities for the two beings dropped the dog and the wounded one ran off into some nearby bushes while the other ran into the craft which took off at speed. This happened to a near neighbour a couple of miles up the Waimata Valley road from us. It happened about a week or two after the encounter the ET's had with me. We knew of it at the time and can believe is as both the residents and the ET's seemed comfortable with each other. The residents accepted the UFO's crop circles and occasional dead cow as "just another day at the office" and left the ET's alone and the ET's were quite cheeky with the frequency of their daytime as well as night time appearances and the evidence they were leaving around. The farmer probably shot the ET as he's shoot anyone who was stealing and hurting his dog. A story that went through Waimata Valley as that a couple of days after the event a distressed ET stepped on the road to flag down one of our neighbours as she drove to town. The silly lady floored it and left the ET by the roadside rather than stop and offer assistance. She missed an opportunity there 2.(1. Original investigation by Bryan Dickeson. 2. Retrospective investigation by Keith Basterfield & Bill Chalker. 3. Dykes, M. (1981). "Strangers In Our Skies." INL. Lower Hutt. pp46-49.) Three women were involved in an abduction case in the midst of a large UFO flap near Gisborne which began in 1977. One night they were lying on a hillside watching the skies, and felt that a period of "missing time" occurred. Shortly after the event a regression hypnosis session was arranged and an abduction scenario revealed. In 1989, during a retrospective investigation by Keith Basterfield and Bill Chalker, a regression session was conducted with one woman. This revealed an account of being drawn up a beam of light; of seeing one of the other women inside the UFO, and of talking to a male entity. All three women were then back on the hillside. I haven't been in touch with the above organisation but I probably know the girls involved in this report. 3" In late December 1978, air freight pilots reported seeing unusual bright lights hovering over Kaikoura, N.Z. Two weeks later, in January 1979, the mysterious lights returned and were videotaped by Australian and New Zealand TV news agencies. Following the sightings, the Royal New Zealand Air Force (RZNAF), the police and the Centre Observatory in Wellington cooperated in an investigation, the results of which were stamped Top Secret and lodged in the National Archives in Wellington. Calling the report "a whitewash," Hassall was quoted by the New Zealand Press as saying, "They discussed how to deal with the problem of (UFO) reports and they all agreed to cooperate and investigate... but not tell the public they were exchanging information. Secretly they were trying to figure it out. No one wanted to deal with the problem of UFO reporting. They didn't know what to do about them, partly through a lack of resources to adequately investigate them. Here are answers for you based on experience I've had with the ET's which has been ongoing. The greys are sentient beings, wether they are synthetic or genetically engineered or from unimproved DNA is unknown to me. What matters in space is an excellent brain and a chassis capable of keeping the brain mobile/operational. Synthetic beings, genetically engineered beings or unimproved DNA beings have an excellent brain and a workable chassis so I would advise not trying to categorise them on the basis of origins. Each grey I've interacted with has their own personality, their own sense of self, they are not under the control of any other being as they let the taller guys know it when the taller guys got something wrong or they disagree with the taller guys. There may be a chain of command like there is in human corporations, it isn't like a military chain of command as corporals don't talk back at sergeants yet the grey's give attitude to the tall guys as well as work with them and share jokes with them. That's how I understand their relationship from observed behaviour over the years. The taller guy in the waimata meeting was in command of medical procedures on the scoutship. A grey may have been in command of the scoutship itself, the grey was more concerned about safety on the scoutship that the tall ET. This could indicate that the grey was responsible for the scout ship or that the grey felt I was dangerous while the tall ET felt I was harmless so wasn't concerned about any threat to the scoutship from my being loose on it. As far as what they have in store for humans, they feel merging of technologies is inevitable and some of them want it to happen ASAP, some feel we are a bit too unreliable/untrustworthy and some don't feel the issue is important enough to express an opinion, they're just here doing their job. Some like conversing with me and others acknowledge my presence when they have to for whatever reason then they carry on with what they are doing. None avoid me. I've found it to be really comfortable in their presence as they are so ordinary in how they relate with me. There is an intelligence and education gap between me and the ET's. I have a good university degree in business studies but they have it all over me in brains and education. The ET's compensate for that and communicate as efficiently with me as humans do. The only thing about their behaviour that does not seem familiar to a human is that they think to you rather than talk to you and you think back to them. Even that feels normal within a minute as it's so easy to do. I suspect if humans have long term exposure to ET's then an under-utilised part of the human brain gets stimulated for telepathic communication. Hopefully this will enable post contact humans to be telepathic too. This is only a suspicion on my part, I've experienced no evidence supporting it that I would bet money on but I'd advocate researching it. Feel free to add that to the account. In a few months I'll try to get evidence to you of how the ET's go about doing things. Apart from some scars and a circular Tattoo and ET did (as a result of my giving it a hard time about me needing a memento it raised part of my skin in a circle so it resembles a perfectly round crater - something human medical technology can't do) I have no physical proof but there is a lot of circumstantial evidence that is overwhelming it it's probability of having an ET source. If you wish to know more, please email me the webmaster and I passed on your comments.